We did it again! Cookie Day 2016 was a great success. Just like we have the last several years, we got together with friends on the last Saturday in November for a traditional Norwegian julebakst. We used an obscene amount of butter and began the Christmas season right by making lots of cookies. And eating other fun stuff, too. My Swedish neighbors have moved back to the motherland (and we miss them terribly!) so it was mostly wannabes this year, with the notable exception of the native Norwegian who taught my advanced grammar course at BYU last year. So, with my kids, the Tarjei and Julianna Gylseth family, LoriAnne Spear, and Dan Hill, we managed to make seven kinds of cookies in 3 hours! Well, technically eight, but the gluten-free krumkaker didn’t want to curl this year, so they were delicious pizzelles. I didn’t take a picture of them but the recipe is included. 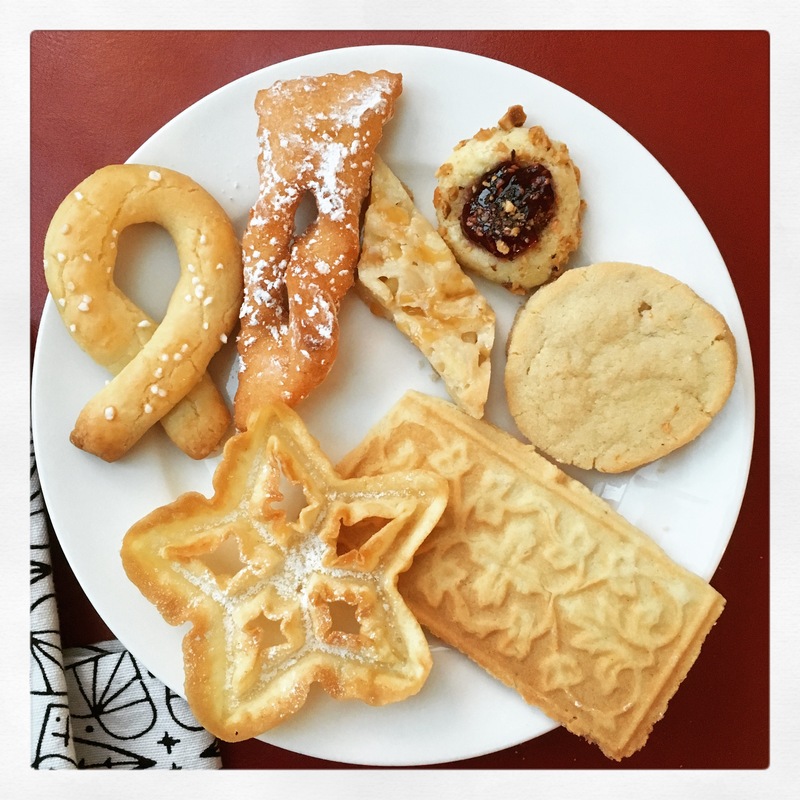 Clockwise, from upper left: Berlinerkranser, Fattigmann, Tosca diamonds, Hazelnut jam thumbprints, Orange-saffron stamp cookies, Goro, and Rosettes. 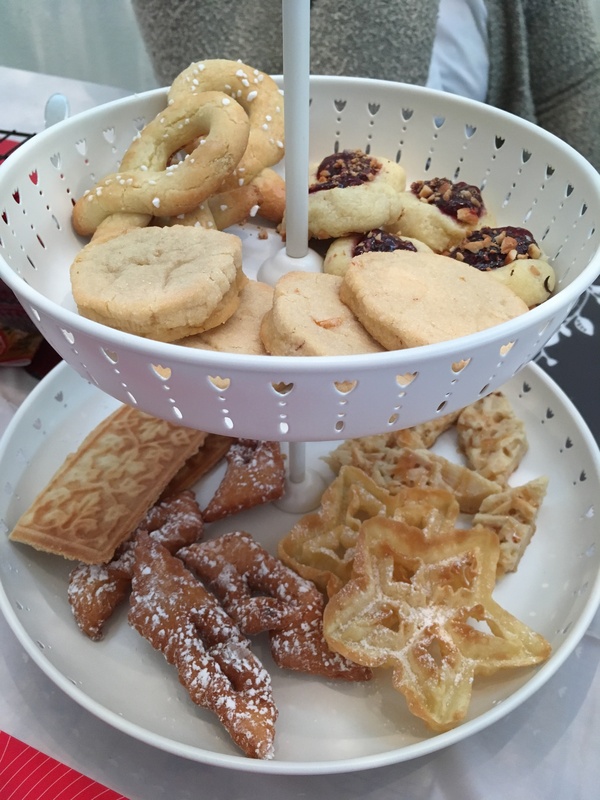 You can find the recipes here: syv-sorter-cookie-recipes-2016. The recipe for fattigmann is included in last year’s file. This year’s recipe collection includes one cookie we didn’t get time to make: hazelnut macaroons. I had a fun time choosing the recipes for this year. I scoured various hashtags on Instagram to find authentic varieties I hadn’t made before, then I Googled some things to find recipes that might work. I also went through all my Scandinavian cookbooks to see what I might have missed before. I don’t pretest the recipes too much so there’s always an element of excitement and surprise as we go at it each year. (But don’t worry, the pdf file is revised after the bake-fest and before I post it here.) Lucky for me, my birthday comes right before Cookie Day, so I was fortunate to get the goro iron and a rosette set to use this year. Yay! So, baking notes: The Berlinerkranser failed last year because the dough was too dry. This year’s recipe is better. I would advise adding the flour slowly and testing the dough by taking a small snake of dough and bending it. If it breaks too easily or won’t make the right shape, there is a little too much flour. For the Tosca diamonds, we used parchment in the pan and that was perfect. This is an easy bar to make. Be generous with the caramel at the end! Yum. 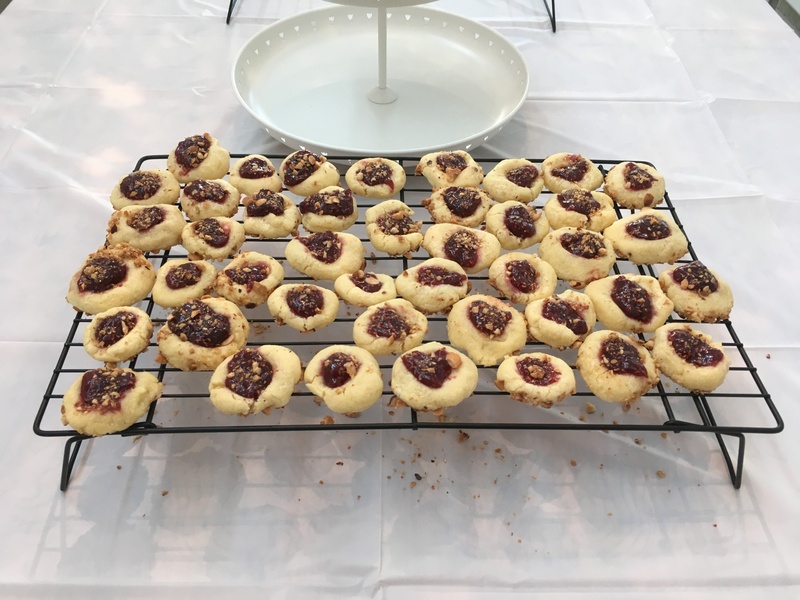 This recipe for hazelnut jam thumbprints may be the best version of this cookie I have ever had. Sometimes these can be overly-buttery and yet dry and thick in the mouth. This version is neither. Very rich, yes, but with the addition of the almond extract and the toasted hazelnuts, it’s a perfect balance to the butter and jam. We recommend making them rather small. The Orange-saffron stamp cookies were my favorite. Must be the cream cheese and the orange flavors. I love that combination. I made this dough ahead of time and had it wrapped in a roll in the fridge so it was easy to just cut and stamp. We made these kind of thick and they were perfect. This one will get repeated. The Goro rectangles were new to me, but I read several recipes before trying them. We didn’t test the looser of the two doughs- simply not enough time this year. But the first dough is great. We used this Bethany Housewares goro iron on a flat-surface electric stove even though it was made for a standard coil-type electric cook top. We just had to be careful to keep the cast aluminum outside the heat ring so that it didn’t melt to the stove. It took longer because a flat cook top cycles its heat on and off, but we managed anyway. Very nice cookie, though. I like it. The Rosettes were something I remember my mother making once or twice. The trick to this one was to get the iron nice and hot before trying to fry a dough on it. They had a harder time coming off of a cooler iron (i.e. the first ones always stuck to the shape). But those were fun, too. Good with jam, by the way. So, to you and yours, we wish you a god jul! May you have as much fun baking as we did! 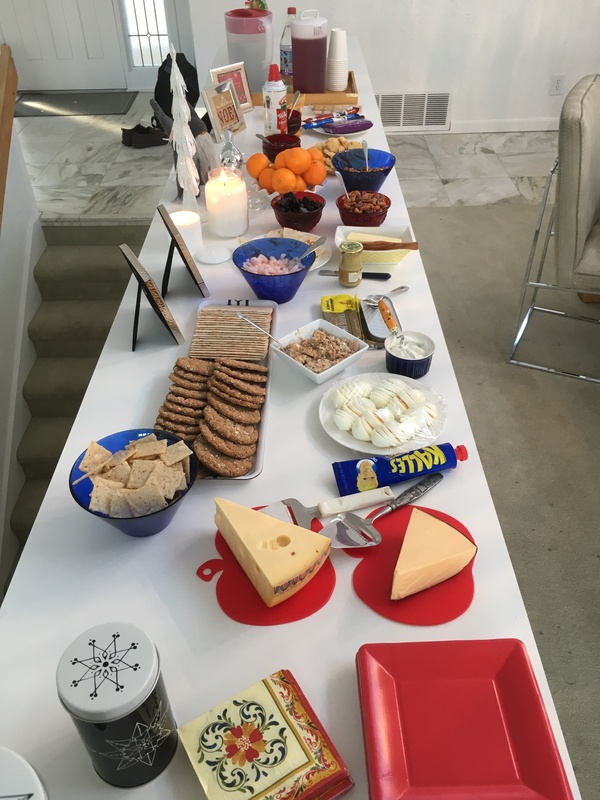 This entry was posted in Holidays, Norwegian, Recipes, Winter and tagged activities for kids, Baking, butter cookies, Christmas cookies, cookies, family fun, food, kitchen, Norway, Norwegian, Norwegian-American, scandinavian by Maren. Bookmark the permalink. Si nice 😃 In Norway there are seven cakes that originally are called syv sorter. Theese are: Sandkaker, pepperkaker, fattigmann, goro, berlinerkranser, krumkaker og serinakaker. I thoughts you might want to know that 😃 Butikk there are still many discussions about which are syv sorter. I use to make others as well. For example serinakaker, stripekjeks, sjakkturnering, smultringer, strull. They Are all Christmas cakes. Toscana diamonds, hazelnut jam thumbprints and orange-saffron stamp cookies I have not in any Norwegian Christmas recipe book. Are they swedish?